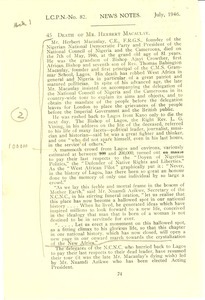 London (England) - Pages 73 and 74 of the League's July newsletter, noting the May 7, 1946 death of Nigerian Council President Herbert Macaulay. 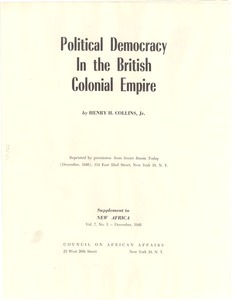 New York (N.Y.) - Report titled, "Political Democracy In the British Colonial Empire," by Henry H. Collins, Jr., discussing a resolution proposed to the United Nations to have colonial powers submit yearly political data on their colonies, the United Kingdom's objection to this resolution, and providing political data on British colonized countries. 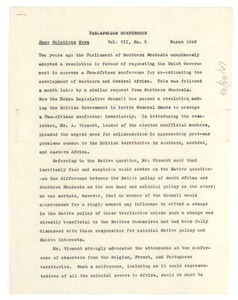 Johannesburg (South Africa) - Manuscript of an article to be published in the March 1945 edition of the Race Relations News on the desire for a Pan African Congress to discuss the development of Southern and Central Africa called by the Union Government, Northern Rhodesia and the Kenya Legislative Council. 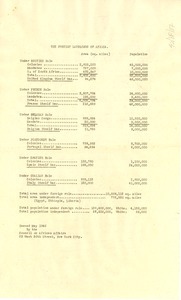 See mums312-b109-i066 for a published version of the article. 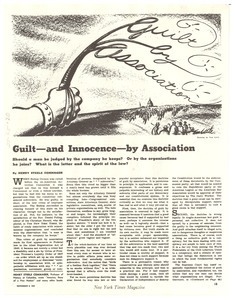 New York (N.Y.) - Henry Steele Commager's examination on how man can be judged by his personal and professional affiliations, reprinted from New York Magazine, and advertising other publications available from the Committee. 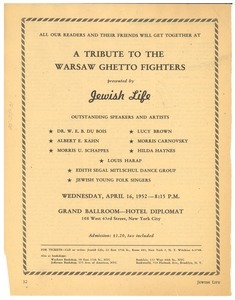 New York (N.Y.) - The first 2 pages of the Council's April bulletin, featuring stories on a mass membership drive, American efforts towards justice for the Italian colonies, and W. E. B. 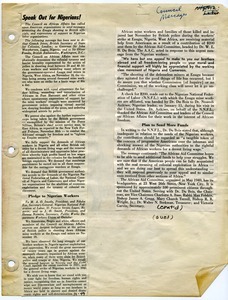 Du Bois's March 27th address at the National Council of the Arts. 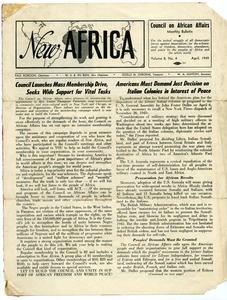 1949 Dec. – 1950 Jan.
New York (N.Y.) - Clippings from the December 1949 and January 1950 issues of "New Africa" (see mums312-b161-i135 and mums312-b128-i094 for complete items, respectively).